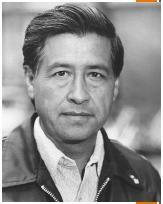 César Estrada Chávez was born near Yuma, Arizona, on March 31, 1927. Eleven years later, his family lost their farm and joined several hundred thousand other migrants working California's crops under terrible conditions. By the time of his death at 63, Chávez had organized farmworkers, improved their wages and living conditions, shaped public awareness, and prompted government regulations that reduced their exposure to dangerous pesticides. After dropping out of school and serving in the U.S. Navy during World War II (1944–1945), Chávez did farm work for seven years. Beginning in 1952, he registered voters and organized chapters of the Community Service Organization (CSO), a Mexican-American equal rights movement, in California. He left CSO in 1962 to establish a separate union that eventually became the United Farm Workers of America (UFW) in 1973. After Chávez led a series of migrant worker strikes against vineyards, most grape growers signed contracts restricting dangerous pesticides as a result, long before comparable government restrictions were put in place. Chávez continued the struggle because most growers persisted in their abusive pesticide practices and refused to renew their contracts with proactive migrant workers. When research found that 300,000 people in central California suffered from pesticide-related illnesses, and there was a high incidence of cancer among children in the same region, Chávez initiated another grape boycott in 1984. He fasted for a life-threatening thirty-six days in mid-1988 to augment his antipesticide protest. Ultimately, his controversial nonviolent strategies significantly raised American awareness of farm pesticide dangers, changed public policies, and concentrated his union's efforts well into the 1990s. In 1994 President Bill Clinton posthumously awarded Chávez the U.S. Medal of Freedom. Days later, Governor Pete Wilson signed a bill making Chávez's birth date an official holiday in California. In carrying out his life's mission, Chávez exemplified a unique blend of beliefs, behaviors, and commitments along with nonviolence, egalitarianism, political activism, volunteerism, solidarity/unity, and respect for all cultures, religions, and lifestyles. SEE ALSO A CTIVISM ; L ABOR , F ARM ; P ESTICIDES . Griswold Del Castillo, Richard, and García, Richard. (1995). César Chávez: A Triumph of Spirit. Tulsa: University of Oklahoma Press. Ferriss, Susan, and Sandoval, Ricardo. (1997). The Fight in the Fields—César Chávez and the Farmworker Movement. Orlando, FL: Harcourt and Brace. Matthiessen, Peter. (1997). Sal Si Puedes (Escape If You Can)—César Chávez and the New American Revolution Berkeley: University of California Press. Ross, Fred. (1989). Conquering Goliath–César Chávez at the Beginning. La Paz, CA: El Taller Grafico Press. San Francisco State University, César E. Chávez Institute for Public Policy Web site. Available from http://www.sfsu.edu/~cecipp . United Farm Workers Web site. Available from http://www.ufw.org . ©Hulton-Deustch Collection/Corbis. Reproduced by permission.